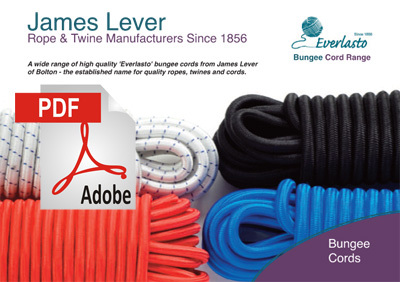 James Lever UK rope and twine manufacturers are suppliers of high quality bungee/shock cords under our brand Everlasto. These bungee cords are manufactured with a tough and hard wearing synthetic outer and a natural rubber core, making these shock cords both strong and flexible and are capable of 100% plus elongation. Our Everlasto bungee cords are UV resistant, waterproof and wear resistant and their durable manufacture will ensure a long life. Our bungee cords are available in various sizes from 10m to 100m as either a hank or on a reel, from 3mm to 10mm in diameter and in a range of colours. In addition to the bungee cord we also offer a range of bungee cord accessories and assemblies including luggage elastics, hooks and hog rings. Lastoflex: Everlasto ‘Lastoflex’ bungee cord is made with a natural rubber core and a smooth braided polypropylene outer. This quality shock cord is UV resistant, waterproof and hard wearing and is available in black, white and a range of colours from 3mm to 10mm diameter. Superflex: Everlasto ‘Superflex’ bungee cord is made with a multi-strand natural rubber core and a tough, abrasian resistant braided polyethylene outer. This high quality shock cord is highly durable and hard wearing, UV resistant, waterproof and is available in black and white from 3mm to 10mm diameter. For further information on shock cords please contact James Lever Ropes and Twines manufacturers. Copyright © 2013 James Lever 1856 Ropes & Twines. All rights reserved.